Peugeot has spent more time and effort launching this car to the fleet industry than any other in its history, and it is easy to see why. Spacious and light, with a range of low emission engines and claims of improved quality, the firm hopes it will prove a big hit with user-choosers, with more sales coming through richer mix, profitable leasing company business and not drop off the radar as the 307 did after a bright start. The 308 certainly feels very large and airy in the front, thanks to what Peugeot calls its ‘semi-tall architecture concept’, although space in the rear didn’t seem anywhere near as generous. From the driver’s seat it feels like you are driving a mini-MPV because of the large amount of glass around you and the high-ish seating position. I’m not a big fan of that, mainly because I prefer to be hunkered down, snuggled low in a car, but that’s a personal preference and you can’t deny that Peugeot has certainly set out to do what it intended. Interior build quality and materials are certainly a step up – possibly a whole set of stairs up – from the 307 and Peugeot can reasonably claim that it is now competing with the very best in class. The chrome-ringed dials and vents and soft touch plastics of the dash and doors all have a premium feel. The only letdown is the centre console, which is made of perfectly good silvery plastic but each unit, for climate control and entertainment, doesn’t line up well and has some give. 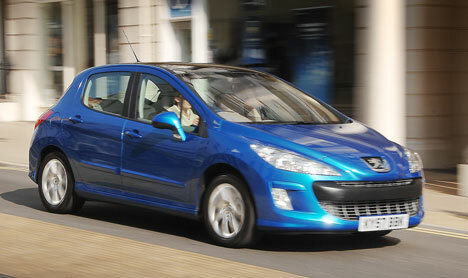 And on the subject of quality, will somebody please give PSA Peugeot-Citroën a decent-feeling gearbox? There’s nothing inherently wrong with the five-speed unit in this car, and it snicks into each gear accurately enough but then flops back to the centre, above third, from fifth or first. It makes it feel baggy, and makes you wonder what on earth it’s going to be like after 60,000 miles, when in fact it might well be no different at all. Overcoming problems with perceived quality is a damned sight harder to rectify than problems with actual quality, and in this sense the 308 does itself no favours. One thing that doesn’t need changing is the 1.6 HDi engine, which is as excellent as it has always been. Although it only has 110bhp, it doesn’t ever feel like it is struggling and has a quiet, soft quality about it. In fifth on the motorway, you don’t feel like you are missing a sixth gear either. As for handling the 308, with its upright stance, does have that odd sensation of most Peugeots that it rolls a bit through corners because you are sitting slightly higher than in other cars, but in fact if you line the dash up with the road, it’s perfectly flat and composed. It also rides nicely and while it’s not a car that inspires you, it does a very good, unfussy, solid job. Perhaps the only complaint would be the steering around the straight-ahead position which has an odd heavy, lifeless feel to it and requires fairly regular corrections. In the first quarter of the turn it feels like you are working against the resistance of a very strong spring. The 308 doesn’t stir the soul in any particular facet but is a good all-rounder. Whether that will be enough to see user-choosers flocking to it remains to be seen. We’ve put the 308 up against one of the top volume performers in the Astra, plus two cars that are strong draws for user-choosers. The 308 has a generous spec list: panoramic glass sunroof, cruise control, automatic lights and wipers, ESP and dual-zone climate control. This 1.6 HDi 110 in the 308 is not the cleanest of cars in the range but is still easily the lowest-emitting of the cars here. But the Astra’s lower P11D price makes it the lowest for BIK tax at £55 a month for a 22% taxpayer. The 308 costs £57, while the Golf is most expensive at £62. There’s absolutely nothing between any of these cars when it comes to service, maintenance and repair and that bodes well for the 308. Often French cars get a bad rap for reliability and despite cheap parts and low labour rates they end up performing badly, but there seem to be none of those concerns for the 308. The 140bhp Golf and Civic are much more powerful cars than the 110bhp Civic and Astra but neither would be especially outshone and have excellent fuel economy. The 308 manages 60.1mpg but the Civic’s combination of power and 55.4mpg makes it particularly impressive. Not surprisingly, the Golf is best when it comes to depreciation, but the Civic is hot on its heels. CAP puts them at 40% and 37% respectively after three years/60,000 miles. The 308 is put at 35% of its value new, while the Astra’s high volumes and its age count against it. The Astra struggles because of the extra depreciation, but the others are closely matched. There’s no one area in which the Civic or Golf perform poorly, though the Golf is more expensive in tax. The 308 looks solid across the board. Its low fuel cost is probably the stand-out area. The 308’s combination of running costs, tax bill and equipment levels put it in the mix at the top of the sector and in SE trim it looks an attractive option. Thinking like a user-chooser, the Golf is at the lower end of its range and not as well-specified, while the Astra starts to run out of puff at this higher price and the Civic is a striking vehicle, decently-specced with a great engine and good running cost, which means it sneaks a win from the 308.